Railpictures.ca - James Knott Photo: Waiting on the Ferguson Ave bridge in crippling heat for over an hour and a half waiting for SOR prompted me to do something I seldom, if ever do: take a picture of a passenger train. But I am sure glad I did! Amtrak 108 on the Grimsby Sub in Hamilton. | Railpictures.ca – Canadian Railway Photography – photographie ferroviaire Canadienne. Caption: Waiting on the Ferguson Ave bridge in crippling heat for over an hour and a half waiting for SOR prompted me to do something I seldom, if ever do: take a picture of a passenger train. But I am sure glad I did! 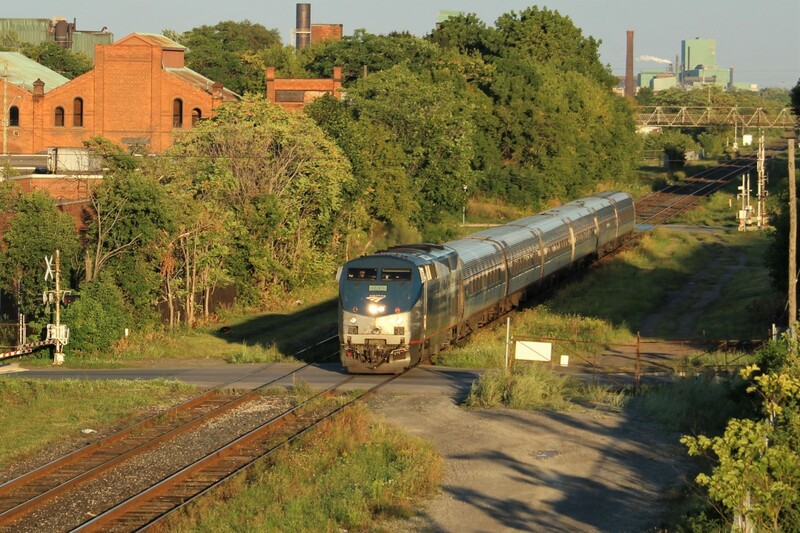 Amtrak 108 on the Grimsby Sub in Hamilton. This light can be had almost daily during the time of the year it’s in light. I heard RTC or car control talking to 422 on the scanner while I was waiting there but couldn’t tell if it was already in Aldershot or was a real late one coming in the early evening hours. When it became evident that it wasn’t coming, this turned into my consolation prize, as I had set my heart on getting a shot with that backdrop and lighting. Without being conceited, I am really happy I did take the shot though as I quite like this one! And yeah I could probably count on one and a half hands the amount of times I have shot passenger trains.